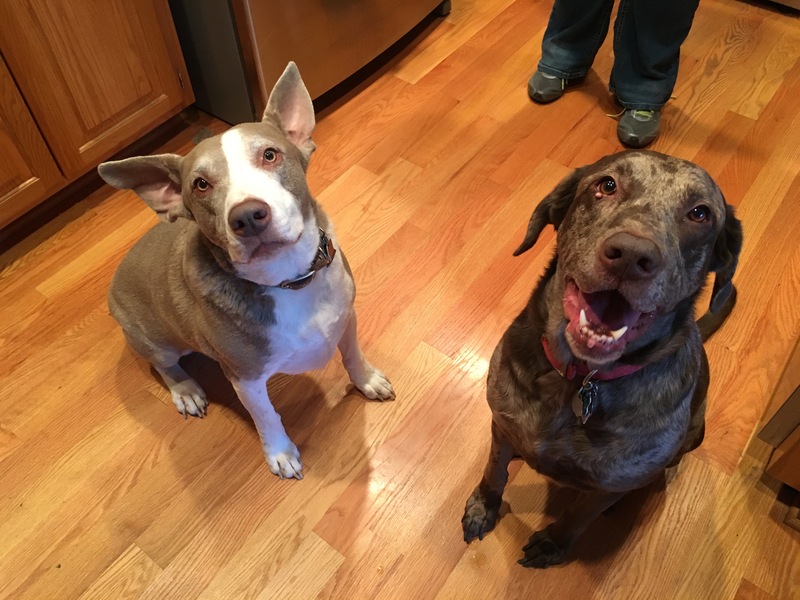 Remi (left) is a five-year-old Pit Weimaraner mix who lives with Gunner, a six-year-old Lab Australian Shepherd mix. Their guardian called me for help with Remi’s reactivity and aggression towards other dogs and Gunner’s overall fearful nature. Remi was certainly the more animated dog when I arrived for the session; continuing to bark a territorial alarm several minutes after I entered the home. During this bark-greeting, I discovered what could be the major culprit in both dogs unbalanced behavior. As Remi continued to bark at me, his guardian reached over and started to pet him while telling him everything was OK.
For humans, it’s natural to try to caress, pet and reassure another human who is in distress. However when you apply this human psychology to canines, you’re actually reinforcing whatever behavior the dog is exhibiting at the time you provide the affection or attention. To Remi, his guardian was actually saying “thank you for barking at this visitor.” I suggested that the guardians stop petting the dogs whenever they are in an excited or unbalanced state. I also suggested that they start practicing what I call petting with a purpose. Instead of simply petting the dogs because they are nearby or when they nudge us for attention, I ask the dog to sit, come or lay down and then only provide attention or affection after the dog complies. If you get into a habit of petting your dog after it obeys a simple command like this, you continually reinforce a healthy leader follower dynamic without even thinking about it. Each time you do this, you tell the dog that following your instruction is rewarded. Clients who adopt this habit find that their dogs start to engage in desired behaviors (like sit, lay and come) instead of jumping up, barking, rubbing up against them or pawing for attention. This is probably one of the simplest changes that a pet guardian can adopt that will have the largest positive impact on their dog’s behavior. Another recommendation I made was that the dog’s guardians start using what I call escalating consequences to disagree with the dogs whenever they engaged in unwanted actions or behaviors. Typically humans do not react or correct a dog until the unwanted behavior gets so annoying that they can’t take it anymore. We look at this as showing patience which is great when dealing with other humans. But to a dog, if it is reacting and you don’t disagree with it, the dog assumes that what it is doing is OK with you. Dogs go through life probing and testing boundaries to see what the limits and rules are. If every time the dog crosses a line and you disagree with it the instant it crosses the boundary, over time the dog is able to determine that the line is a border that it is to stay behind. To this end I recommended that the guardians start to immediately disagree with the dog’s unwanted behaviors at the first instance. By immediately disagreeing with the dogs using these escalating consequences the instant that they begin, it’s much easier for the dogs to understand what it is we do not want them to do. When we set up the appointment date, Gunner’s guardian said that he was afraid of everything. But the dog that I met during the session wasn’t a fearful one, it was a needy one. This was no doubt the result of the guardian instinctively petting and reassuring the dog anytime that it encountered something it did not understand. Making matters worse, the guardians allowed Gunner to constantly be on top of or leaning against them. While there’s nothing wrong with being in contact with your dog, a dog that has to always be next to or leaning on it’s guardian can easily develop some insecurity. This is almost certainly the case with Gunner. To help the dog start to rebuild his confidence and self-esteem I suggested that his guardian disagree with him when he showed this needy behavior. The most prominent way to do this is to define her personal space so that the dog gets used to sitting next to them but not necessarily always in physical contact with them. It didn’t take long before Gunner was starting to understand what his guardian was asking from him. It was great to see the dog sitting contently a few feet away from his guardian rather then leaning up against her with out her needing to disagree or remind him. Now that we had addressed most of the issues that had impacted the dogs behavior in ways the guardians did not want, I walked the guardians through a leadership exercise that I developed a few years ago. This exercise involves placing a high-value item on the floor then claiming it as another dog would. In this situation we used a stinky smelling meat treat. I started out with Gunner because his guardian said he would be more difficult to keep away from the treat. It only took three repetitions before Gunner seem to understand what I was asking from him. At that point I had his guardian practice the exercise so that I could coach her through it until she got the same response. At first his guardian moved a little bit hesitantly and failed to turn to keep him in front of her hips and shoulders which is crucially important. But as she continued to practice, her responsiveness as well as the dogs reaction improved. Once we finished with Gunner I had the guardians place him into a kennel so that we could repeat the exercise with Remi. I could instantly see that Remi was actually the insecure dog out of the pair. It only took one correction to back him away from advancing on the treat. But once I did correct him, he started barking at me incessantly. It took a few minutes before he eventually settled and then laid down to communicate he was no longer challenging for the treat. As soon as he did this I leaned over and tapped near the treat to communicate that it was OK for him to come and take it. But due to having lower confidence, Remi didn’t understand what I was asking from him. This is an advanced exercise and is difficult for some dogs to complete. Especially those with lower self-esteem or confidence. At the start of the exercise, I communicate to the dog that is to leave the tree alone until I give it permission. But once the dog surrenders and I actually do give this permission, some dog see it as a trick (You said no before). This was certainly the case with Remi who continued to bark at me for a few minutes after I tapped and gave him permission to get the treat. I had to use a few tricks to help Remi understand that he actually could come and have the treat now. I ran through the exercise a few times with him until he got up and took the treat faster and faster. In time, Remi’s confidence will grow as he has more practice with this exercise. It will be important for his guardians to practice this exercise with both dogs on a daily basis for the next 10 to 14 days. The goal is to start increasing the amount of time the dog has to wait after laying down before it is given permission to get the reward. This allows the dog the ability to practice restraining itself which will have far-reaching benefits for both dogs unwanted behaviors. By the end of the session, both dogs were exhausted. Dogs are instinctive and reactive creatures and don’t typically spend a lot of time using their brains the way we had during the session. Still I could already see a difference in their behavior. Gunner didn’t appear as needy; giving the humans a small buffer of personal space on his own. Remi was reacting to their commands and corrections quicker and seemed to have a better understanding of what they wanted from him. Now that their guardians know to stop petting the dogs when they are in an unbalanced state, the other exercises and techniques that we introduced will start to rebuild the dogs self-esteem and confidence. For many of my client’s dogs who are reactive to other dogs, incorporating new rules, boundaries and limits inside the home translates into a better behaved dog outside. I asked the dogs guardians to religiously adopt all of the techniques, rules, boundaries and exercises for the next month and then to contact me and let me know how the progress is going. For about 75% of my clients wants the dogs adopt a new respectful follow her mentality there reactivity went outside on walks is eliminated completely. If that is not the case for Remi then we will need to schedule a follow-up session to exclusively focus on his dog aggression.